In or out of the fridge? Depends on the fruit! Avocados, tomatoes, mangoes, melons, apples, and pears will continue to ripen if left sitting out on a countertop. For sweeter tasting fruit: it’s always best to allow fruit to fully ripen first before storing them in the refrigerator. The exception are grapes, citrus, and berries which do not ripen, only deteriorate, and do better refrigerated right away. Bananas and apples will speed up the ripening of any nearby fruit – which is a good thing if you need it, but can ruin a bunch if you’re not careful! 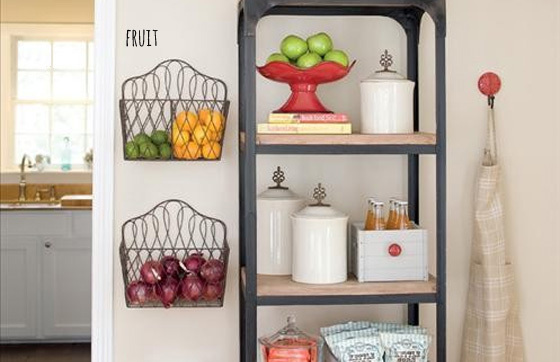 I love the idea above of repurposing a magazine rack as a hanging fruit basket to save counter space! Berries need a little extra attention! Berries get their own category for being the most delicate (high-maintenance) of fruit! Berries (and grapes) have a dusty covering called a “bloom” which is a natural preservative, so best not to pre-wash them before storing away, or they might go bad quicker. 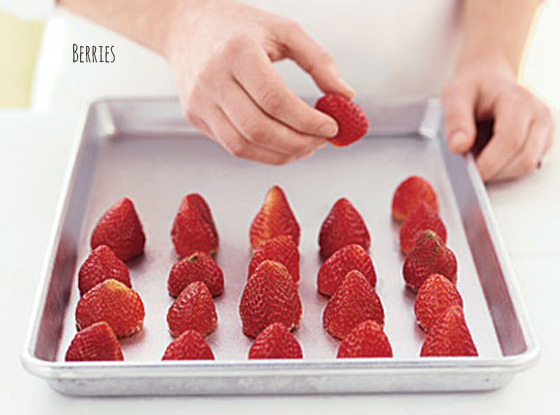 We’ve all lost a punett to mold, so if you can’t get to your berries in time (2-4 days) – make sure to freeze them! A good trick is to freeze them flat first, before putting them in a container. This keeps them from becoming one big berry-ice-block, that you have to smash against the floor to break up. Yeah… that’s happened before! Tip: with your strawberries, if you plan to use them for smoothies – don’t cut off the green tops – blend them up too!. They provide vitamins and minerals just like any other leafy green! To pre-wash or not to pre-wash? There is a definite divide between people on how they keep their leafy greens. One side has a more hands-on approach: wash, rinse, dry and wrap. The other side believe greens should be left alone: unwashed and put into the refrigerator the same way it arrived. Both sides agree that greens need to be fully dry and kept in the refrigerator! If your greens begin to wilt or look a bit limp, don’t give up on them! You can refresh them in an ice-bath to eat that day. 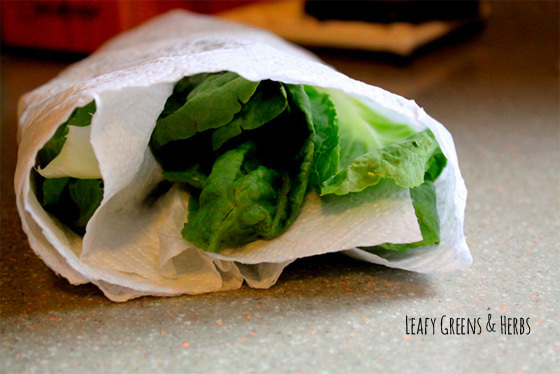 If your supermarket greens & herbs come wrapped in plastic – reuse the same plastic for storage. If you prefer to keep plastic out of the fridge – use dry paper, dishcloths and glass containers. Parsley, mint and coriander can be kept in water like a bouquet – just make sure their leaves do not get wet and cover it with a plastic bag or light dishcloth. Delicate herbs like Chives, Chervil and Basil can easily turn black – wrap it first in paper or dishcloth and then store it in a plastic bag or glass container. Spuds like to be left alone! 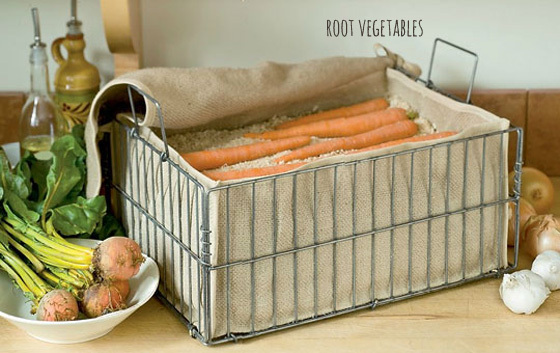 Root vegetables, like potatoes and carrots, prefer a dry spot, away from moisture. A hard ask in Singapore! The image above shows them stored in a basket filled with sawdust to keep them very dry, but you can use any container that provides good ventilation. Try not to keep potatoes them in the refrigerator, the cold causes the starches to convert into sugars, giving them an unpleasantly sweet taste. Like all your root veg, onion & garlic do best out in a dry spot. 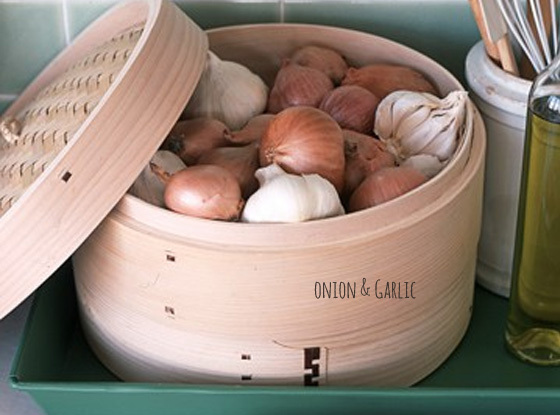 I love this idea for keeping them in a repurposed steaming basket – it provides air circulation and looks good! If your garlic or onion sprout, the green shoot will have a bitter, unpleasant taste so you can either cut it out, or plant the bulb and let it grow! 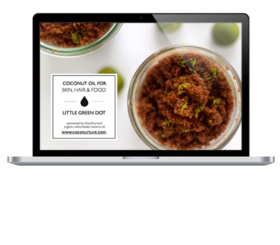 Hope that helps you – I know it’s been helping me and I’m excited to say that I have not had to throw out a punett of berries in a very long time now!